I’m looking forward to lesson 9. It’s puddings and pate sucree (sweet short pastry). After the disaster with the pastry for the quiche I was determined to do a good job – so much so that I churned out several sweet tarts at the weekend. It starts well. The pastry looks good and is in the fridge resting. The batter for the flan is done. And the first stage of the rice pudding is in the oven. I take it out to check if it’s ready for me to add the creamed mixture of egg yolks, sugar and butter. Pots with handles are used on the stove top as well as in the oven. It’s a real trap for those of us not used to working in commercial kitchens. I take the pot out of the oven and put it on the stove top forgetting that the handle is searingly hot. I grasp it with my left hand. It leaves a significant burn. It hurts too much to joke about. I run it under cold water. Someone gets me some ice. The relief is only temporary. I am so mad with myself. I feel clumsy and stupid. How am I going to get through the rest of the practical. I have got pastry to roll out, a gazillion eggs to crack and separate, vanilla beans to cut and scrap, plus make a Sauce Anglaise (which seems like a science lesson) to serve with the flan. Even if I get it all done I am going to be really late serving. I get the pastry rolled out in between breaks to change the ice that’s melted in my hand. Others kindly offer to help but I box on. My spirits lighten slightly when the pastry case looks perfect. There’s still a huge amount to do, though. It’s the only time so far in the course that I have wanted the day to end. I’m really struggling. A fellow student offers me some papaw cream. It works. The stinging eases. I start to speed up but I am still well behind and feel disheartened. The Sauce Anglaise coats the spoon as per Chef’s instructions. The rice pudding is creamy, rich and sweet. The flan is in the oven. It’s loaded with raspberry and the batter. It’s taking an age to cook. Others have already presented their work to Chef for marking. I’m still zesting and filleting an orange for garnish. And the raspberry tart still isn’t cooked. I start plating up the rice. The tart now looks set but I need to let it cool a little before taking it out of the tin. I’m ready to serve. It all looks fantastic. You’ll have to take my word for it. I’m so relieved it’s over that I forget to take photos. 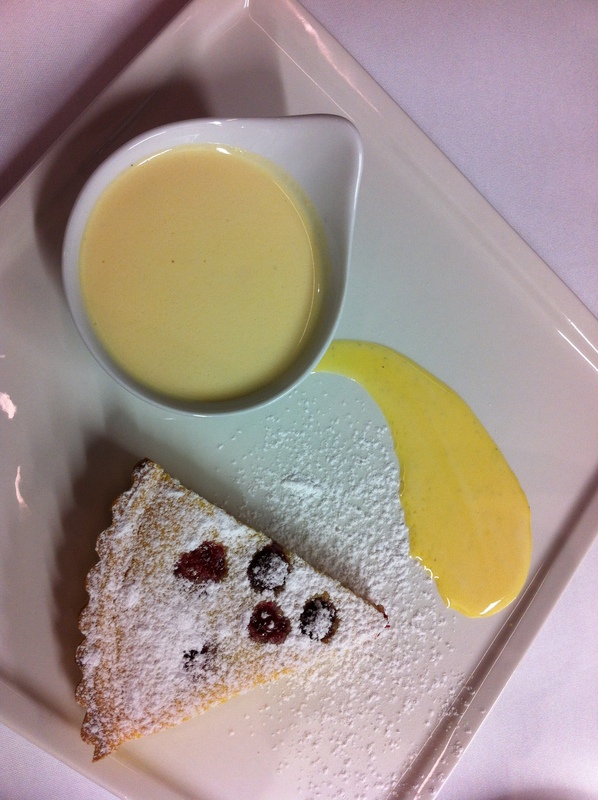 Another of chef’s fantastic treats for us to sample. 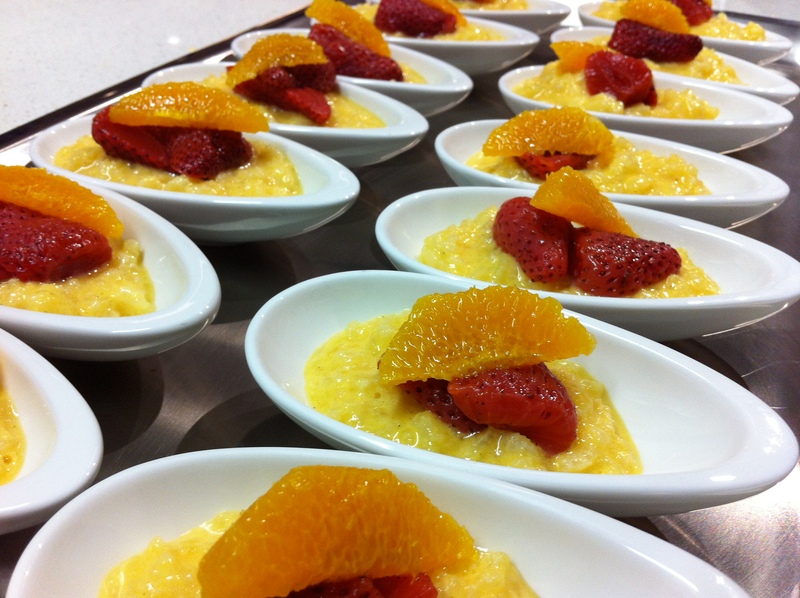 Rice pudding French style served with strawberries poached in chardonnay and sugar. « Lesson Eight – “You can never have too much butter”. What a trooper! And a trouper too. Hard lesson but sounds like the results were perfect. Well done you. Please don’t stop, loving your blog, just loving it! Congrats on topping your class. That custard was to die for!